AVELINE - Veüe et perspective du Pont du Gard ouvrage magnifique bâtie près de la ville de Nismes. . .
AVELINE, P.A. - Veüe et perspective du Pont du Gard ouvrage magnifique bâtie près de la ville de Nismes. . .
Veüe et perspective du Pont du Gard ouvrage magnifique bâtie près de la ville de Nismes. . . - AVELINE, P.A. 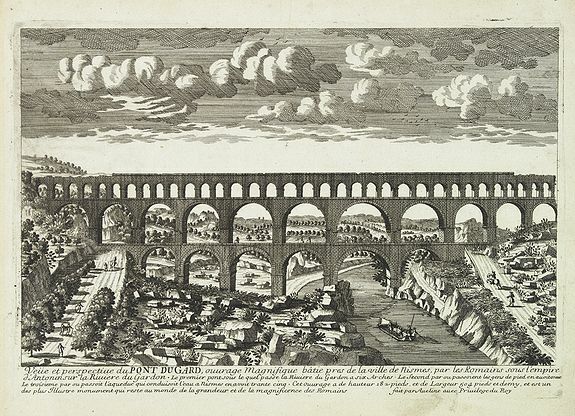 Title : Veüe et perspective du Pont du Gard ouvrage magnifique bâtie près de la ville de Nismes. . ..
Map maker : AVELINE, P.A.. Size : 8.3 x 12.1 inches. / 21.0 x 30.8 cm. Description :A very decorative and extremely raretown-viewof Pont du Gard. The Pont du Gard was built shortly before the Christian era to allow the aqueduct of Nîmes (which is almost 50 km long) to cross the Gard river. The Roman architects and hydraulic engineers who designed this bridge, which stands almost 50 m high and is on three levels - the longest measuring 275 m - created a technical as well as an artistic masterpiece. Engraved by Pierre-Alexandre Aveline. With "fait par Aveline avec Privilege du Roy" in lower right margin. Pierre Aveline (Paris, c.1656 - 23 May 1722), was an engraver, print-publisher and print-seller. He probably trained with Adam Pérelle and, like him, specialized in topographical representations. He engraved in suites many views of Paris and of provincial, European and African cities, mixing etching and burin. In 1685 he obtained a royal license for ten years, authorizing him to reproduce 'le profil des maisons royales'. Among the 412 items that comprise his |x|uvre, there are only two portraits and two prints of historical subjects. Condition : Good and dark impression, laid down on paper. Paper slightly browned.